The Huskies made their largest trip of the year back east to New Haven, Connecticut to compete at the Yale Invitational. The tournament brought together a majority of the programs that competed at least seasons National Championship Tournament, including the champion and runner-up. UW put up another strong showing. Team 1366 finished at a record of 2-6 against divisions in the "A" team, despite being unstacked themselves. After a close split with Northern Illinois University to start the tournament, Purple Team split with Washington University (St. Louis), who ended up placing at the tournament. 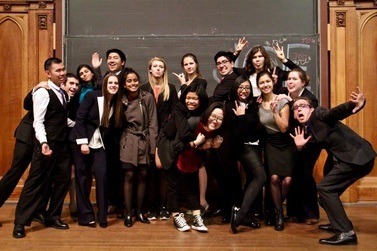 On Sunday, the team dropped the third round to Cornell University and narrowly lost to Northwestern. Team 1367 came up short with their opening round, falling to the eventual division champions, Tufts B. But, the Dawgs rebounded well with split decisions against Yale C and Princeton. The weekend ended on a high note, with a decisive win over Howard. Two individuals--Hayley Orr and Thomas Karagounis--were recognized for their outstanding performances at the closing ceremony. After this, the Huskies get a well-deserved break for the holidays and teams will be re-shuffled for the upcoming tournaments. Next stop, Arizona's Gunslinger Invitational over MLK weekend.